Present investigation is an exertion to explore safe means of water for the community in the water scare region. In order to accomplish such goal origin of springs as well as chemical analyses of groundwater samples from different locations were carried out. Four zones are discovered on the basis of nature of water points, rock types and water chemistry. These zones are Hard Rocks Springs (HRS), Valley Springs (VS), Recharge Areas Aquifers (RAA) and Central Valley Aquifers (CVA). HRS are originated from thick successions of limestone (Kirthar Limestone) and thick packages of channelized sandstone and conglomerates of the Siwalik Group. It is recommended that Chiltan, Parh, Kirthar, Dhok Pathan and Soan formations may be focused for future needs of safe water supply in the Quetta valley. This study includes the analysis of different physico-chemical parameters such as Total dissolved solids (TDS), pH, turbidity, Electrical conductivity (EC), hydrochemical facies, Sodium Adsorption Ration (SAR), Sodium Percent (Na%), Kelleys Index (KI), Permeability Index (PI), major cation and anions to assess the quality of groundwater sources. The outcomes of groundwater analyses were equated with various drinking water standards e.g., NSDWQ-Pak, USEPA, and EU. The results are plotted for determination of lateral variations and to empathize the reasons of these variations. The affects of rock types, geological structures as well as anthropogenic causes on origin and results are discussed systematically. The hydrochemical facies identified show that the alkaline earth exceeds alkalies, strong acids exceeds weak acids, mixed type (no cation, anion exceeds 50%), no dominant cation and anion types but water of VS is calcium chloride and sulfate type. The water is classified as C2-S1 (HRS), C3-S1 (CVA & RAA) and C3-S2 (VS) based on SAR and EC values, which intend that most water samples can be used for irrigation safely except water samples collected from VS. Based on the Na% the water samples are categorized as excellent to good and good to permissible limits. The water is suitable for irrigation as all samples bear KI less than 1. The PI values in the water samples studied (less than 40) also contemplate that the water is desirable for irrigation use, although caution is needed of VS water. human health and the environment. The study aimed to explore the effects of exposure to pesticides on the liver functions and acetycholinesterase levels in serum (AChES) and red blood cells (AChER) of 100 male participating in agricultural work ranging in age between 20 and 60 year with mean age 37.11±9.3. One hundred males matched for age and socio economic status were recruited as a control group to compare levels of alanine aminotransferase (ALT), aspartate aminotransferase (AST), bilriubin, alkaline phosphatase (ALP), total protein, AChES and AChER. The results indicate that AST, ALT and ALP were significantly (P<0.05) increased in pesticide-exposed workers compared with control. There was also a highly significantly (P<0.01) decrease in AChER among male agriculture workers compared with controls. At 10 - 50 times of pesticides applications there was a significantly (P<0.05) decrease in AChER and increase in AST, ALT and ALP activity among exposed group. However, there was a negative correlation between AST, ALT, direct bilirubin, and AChES and age among control group and a positive correlation between ALT and AST and age among exposed group. According to the number of pesticide application, there was a positive correlation between AST, ALP, total and direct bilirubin and number of pesticide application. Agricultural villages in Egypt require more attention to decrease the percentage of literacy among the farmers and raise their health awareness. Onsite rainwater harvesting is an inexpensive water source for indoor use; it is also a sustainable water management practice, since it may contribute to the reduction of runoff volume and peaks, and to the control of non-point source pollution. 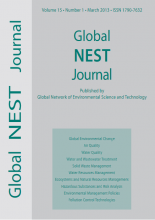 The aim of this paper is to provide a method for sizing rainwater harvesting tanks based on the local daily rainfall record, the served family size, the roof collection area, the roof type, the in-house water uses, and other factors. Various methods used worldwide are presented and compared. The comparative application of these methods is made using a daily rainfall record from a meteorological station near Kimmeria Village in Xanthi, Northeast Greece. Based on the proposed method here, the optimum tank size is computed by allowing excess water to overflow and setting to zero the use of the public water supply; the method may result in reduced tank sizes compared to other methods tested. Amoxicillin degradation with and without high frequency ultrasound waves of 2.4 MHz has been investigated. The concentration of amoxicillin was selected to be similar to that of outlet wastewater effluent concentration in pharmaceutical industry namely 50 and 100 ppm. The application of ultrasound waves together with the addition of hydrogen peroxide H2O2 increased the rate of degradation of antibiotic amoxicillin. The doses of H2O2 used were 5, 2, 1, and 0.1 ml in a solution of 50 ml of amoxicillin. The study showed that ultrasound waves and H2O2 had improved amoxicillin degradation. The ultrasound has improved the degradation rate more than two times in comparison to amoxicillin solution without ultrasound waves. This degradation rate has been achieved within 90 minutes. The study examined the willingness of rural households to pay for sustainable management of community forests in Southwest Nigeria. The value elicitation format used was the dichotomous choice contingent valuation technique. The multistage random sampling technique was used in selecting 180 rural households for the study. Data obtained were analyzed using descriptive statistics and logit regression analysis. Evidence from the logit model indicated that the mean willingness of rural households to pay for sustainable management of community forests was ₦389.04/month. The result also shows that bid, perceived importance of forests, age, educational level of household head, total household income, perception of deforestation effect and intergenerational equity were the significant factors that influence the rural households’ probability of willingness to pay for community forests management. The study recommends policy measures aimed at inclusion of rural communities in the management of community forests as the rural people are willing to pay for its management which will help ensure sustainable management of forest resources and as well improve the welfare of the rural households. Non-point sources pollution from highway runoff is among the most important reasons for surface and ground waters degradation. Atmospheric deposition, exhaust emissions, pavement wear and tire wear all have been found to be crucial pollutants in highway runoff. The most critical pollutants included in the runoff of interurban roads such as total suspended solids, heavy metals, chlorides and nutrients, together with the factors affecting their concentration are been investigated. Existing legislation about drainage and highway stormwater management in United States and European Union as well as the federal agencies of the United States which have the responsibility to regulate drainage and stormwater management are also presented. Water pollution concerns in the Unites States are mainly addressed through the Federal Water Pollution Control Act of 1972, known as the Clean Water Act. Provisions within the Clean Water Act require all states to implement regulations in order to reduce the pollutant mass loading prior to discharging into water recipients. In European Union the Water Framework Directive 2000/60/EC sets common goals for the water management and created an overall water policy for management at an international level. Thermogravimetric analysis combined with a mass spectroscopy detector was used to study the thermal stability of solid materials earmarked for processing by thermal desorption (for example during the amelioration of environmental damage). The objective of the study was to verify the applicability of thermogravimetric analysis as a simple and fast tool capable of providing basic information about the behavior of a particular solid material during its heating to a given temperature. Samples of materials representing the spectrum of solids customarily treated during environmental remediation (soils, bricks, and concrete) were used as the model solid matrices. The measurements demonstrated a high informative power of thermogravimetric analysis, which may help predict many technologically important aspects of the thermal desorption process.